Step into a sci-fi disaster with Alien Robots, a truly mind-boggling video slot. The game allows players to use a conventional payline system, or wager double to abolish the paylines completely and go for 243 total ways to win. See how kind these machines really are for yourself. Give this game a try on our website for free, or register at any listed NetEnt casino to play for real money. Start by choosing how much you want to wager. Press the buttons by Coin Value to set your coin denomination. Use the Lines + Ways buttons to select how many active paylines you would like. Press it all the way to the right to use 243 ways instead. Since you only have to pay for 60 of the ways, this is definitely to your advantage. Press the buttons by Bet Level to change the number of coins wagered per line. Click the circular arrow button to start spinning, or use Max Bet to wager 5 coins with 243 ways activated. Use the Autoplay button to play several times continuously. In addition to having 243 ways to win, Alien Robots gives players plenty of opportunities to have a memorable chance at walking away with cash. Get three or more scattered UFOs to activate the game’s rewarding free spins feature. If a wild appears during these free spins, it will activate the expanding sticky wild feature. The wild will expand and the reel will re-spin once, greatly increasing your shot at walking away with a jackpot. With any luck, these strange creatures will lavish you with wealth. Coin Value: Change the coin denomination. Lines + Ways: Select how many paylines to activate, or to activate 243 ways. Bet Level: Select how many coins to wager on active lines. Max Bet: Spin at a bet of 5 coins on all 243 ways (300 coins per spin). Autoplay: Spin the chosen number of times without interruption. Landing three of the UFO scatter symbols anywhere on the reels in standard gameplay will trigger 10 free spins. Four or five scatter symbols will reward you with 20 or 50 free spins. During the free spins bonus game the wild symbol starts to have an extra effect; if you manage to land one on a spin then it will expand to cover all the symbols on that reel and it will also become sticky. You will then get a a free respin while the expanded wild remains in place, giving you more chances of creating winning combos. 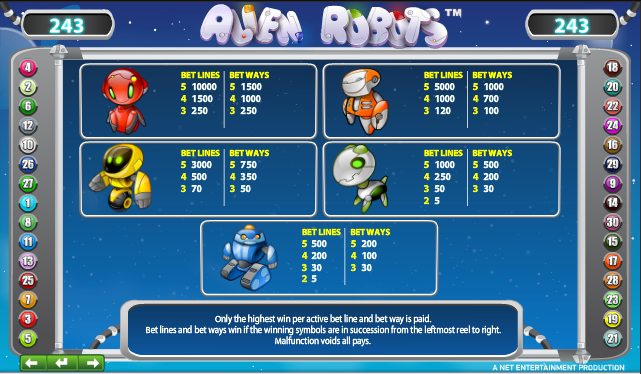 Alien Robots offers you the opportunity to pick the number of paylines you bet on but also gives you the chance to use 243 ways to win. This will cost you double your stake but will obviously give you plenty more winning possibilities. 243 ways means that paylines are largely redundant and symbols just need to be in adjacent reels to make a winning combo.